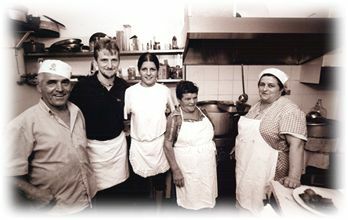 In 1953 the restaurant was opened by Nadia's mum, and in 1992 it was restructured. It offers place for about 35 persons. The prepared local dishes are simple and homemade. We recommend you to book in time and eventually to specify the dishes which are only prepared on request. Already 1,000 b.Chr. the first habitants lived in this village. Together with Chiesanuova it is one of the valley's most antique villages. The village has been constructed behind a mountain in order to be protected against pirates. The church goes back to 1600, and also most of the houses are constructed in this period. The local products are olives, salted anchovies, wine and oil. In Lavaggiorosso you can find the antique inn "Zita", a simple restaurant with great atmosphere, on the top of the valley managed by a very nice family who is able to combine kindness with more than favorable prices. Delicious also the main courses like rabbit with pine-seeds, wild boar and stuffed mussels. 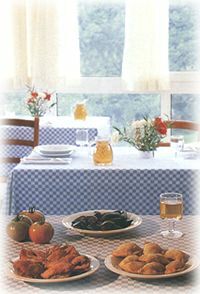 The inn's menu is dominated by the dishes based on meat and by the really genuine local red and white wine. After lunch it is possible to take a walk thought the nearby olive groves, enjoying silence and peace. From the terrace you can admire the light myriad of the valley of the Gulf of Levanto - the night here is very beautiful and extraordinary and it seems that one is able to touch the stars, lengthening a hand. "Cima" (boiled meatloaf based on beef, mortadella, bread, eggs, cheese) - a cold dish served in slices. Stuffed anchovies and stuffed mussels. Wild boar with pine-seeds and olives. In addition seasonal dishes. Welcome ...Buon appetito!